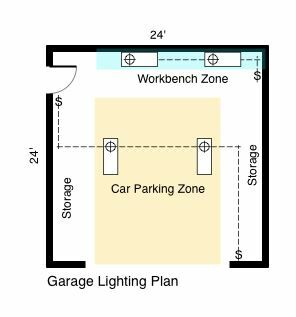 Follow the tips and advice used for the garage lighting plan shown below and it will be clear as a bell. The plan shows a typical 2 car garage that is 24' wide and 24' deep. It has a single 16' wide overhead door that is centered and a 3' man door near the rear. The light blue shaded area is the Workbench Zone and the beige shaded area is the Car Parking Zone for two autos. The white area is general storage such as wall shelving, lawnmowers, garden equipment and travel area for passing through and getting in and out of the cars. The interior lighting fixtures shown are 4' long - 2 tube fluorescent fixtures that use very little electricity and put out lots of light. The fixtures in the Car Parking Zone are for general lighting and cast light upon the storage areas and travel zones. The fixtures over the Workbench Zone are for task lighting and cast light onto the workbench surface and the wall behind it where tools can hang on a pegboard setup. The common sense rules for the placement of the fixtures are as follows: For the general lighting in the center of the garage you should center the fixtures from front to back. In this case, 12' from the overhead garage doors wall and 12' from the workbench wall. For the side-to-side placement the fixtures should be set in from the side walls a distance equal to twenty-five percent (25%) of the garage width. In this case, 6' from each side wall. The direct task lighting requires the fixtures be set directly above the work surface and generally centered over the length of the workbench. This distance can vary depending on what type of work setup you place along this wall, but in all cases for a garage the size as shown, no more than two fixtures would be required. Garage Tips: If you live in cold weather country and you want florescent lighting, make sure you get fixtures with cold weather starters (electronic ballasts) if your parking/work space is not heated. That way they will come on instantly in the cold without any flickering or dimming. For information on various types of interior and exterior lighting available, study our pages: Garage Interior Lighting, Garage Wall Lighting, Garage Specialty Lighting, Garage Exterior Lighting, Portable Lighting, Outdoor Garage Lighting. Illuminate our readers with your GarageTips and experience concerning garage lighting. Tell us your story and how you approached your project. If you have photos or graphics, feel free to upload them.